Billy was born a musician, raised to be an entertainer and from childhood has been an Elvis Presley fan. From the songs of the 50’s and 60’s to the elaborate shows of the 70’s, Billy delivers the KING at his best. Come on out to Buffalo Wild Wings in Midland on April 14th and 20% of your food bill will go to Camp Fish Tales! Open 11 AM – CLOSE. Print and bring the flyer below with you! Sam Forshee presents a check to Camp Fish Tales Executive Director Beth Dow at an open house on May 20. 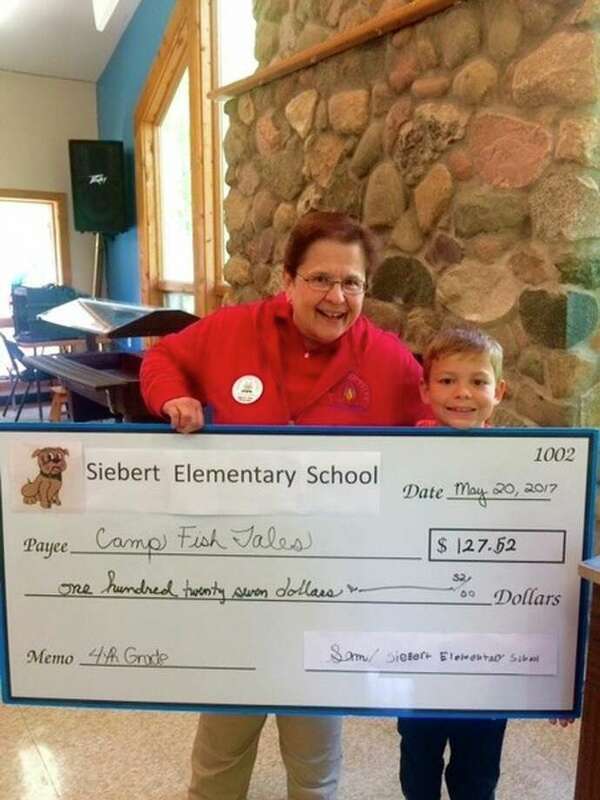 Sam Forshee, a student from Susan Shaffer’s 4th grade classroom at Siebert Elementary, recently organized a fundraiser benefiting Camp Fish Tales. Camp Fish Tales is a nonprofit, located in Bay County, that provides an outdoor camping experience for children and adults with special needs. Forshee organized a group of classmates, held meetings at recess and made a formal presentation to his class. He then sent information about the fundraiser home with his classmates asking for help raising money and awareness. Forshee and his classmates collected donations for one month before totaling the proceeds.